Understanding the Past to Build the Future is a five-year multidisciplinary study of the history of the Inuit Métis of southern Labrador. It is funded by the Social Sciences and Humanities Research Council of Canada (SSHRC) through the Community-University Research Alliances (CURA) programme, as well as the community partners listed below. The research objectives include investigating the Inuit occupation of Southern Labrador, collecting and analyzing evidence of Inuit-European interactions, documenting cultural changes, and bringing the history of the Métis into the present day. Research activities include archaeology, ethnography, archival study, and genealogy. 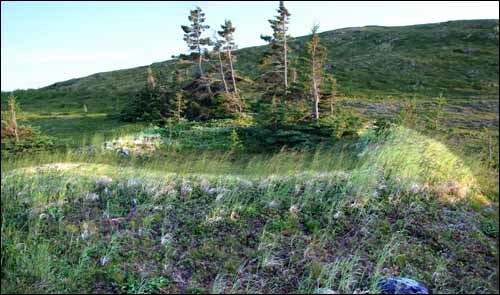 New archaeological research to better understand the pre-contact and early contact period of Inuit occupation in Southern Labrador will focus on Inuit habitation sites near Sandwich and St. Michael's Bays. Research in European and North American church archives will include research on Moravian, Methodist and Anglican missions in Labrador to provide details of interactions between Inuit and Europeans along the Labrador coast. The economic and social history of the southern Labrador coast will be documented through searching archives for ships' logs, journals and diaries describing Labrador's social condition of the 18th and 19th centuries. Research into the more recent social history of the Métis will examine the role of social stigma and the development of Métis identity. Ms. Eva Luther, St. Lewis, NL. Early contact period sod-walled Inuit house structure, near Sandwich Bay. Air Labrador, The Anglican Church of Canada, Archives of the Roman Catholic Archdiocese of St. John's, Battle Harbour Historic Trust, Cartwright-L'Anse au Clair MHA office, Cartwright Town Council, Community Youth Network, Eagle River Development Association, Labrador M. P. Office (House of Commons), The Labrador Institute, The Labrador Interpretation Centre, NunatuKavut, The Labrador School Board, Mary's Harbour Town Council, Memorial University, The Moravian Church in Newfoundland and Labrador, Parks Canada, Port Hope Simpson Town Council, Provincial Archaeology Office of Newfoundland and Labrador, The Rooms, The Senate of Canada, Smart Labrador IT Initiative, Southeast Aurora Development Corporation, St. Lewis Town Council, Town Council of Charlottetown, Town of Happy Valley-Goose Bay, The United Church of Canada, The University of New Brunswick. This research project combines and applies academic and community-based knowledge for the benefit of all stakeholders. A key outcome will be the incorporation of information into school curricula for southern Labrador, and material for adult literacy support. This will in turn result in greater local content for use in social studies and history classes, hopefully attracting student interest and stimulating learning. Métis students and adults will also be trained in archaeological field methods, archival research, and ethnographic and educational work. In cooperation with community members, the results of the research will be made available as written and electronic resources for educational purposes and for the wider public. 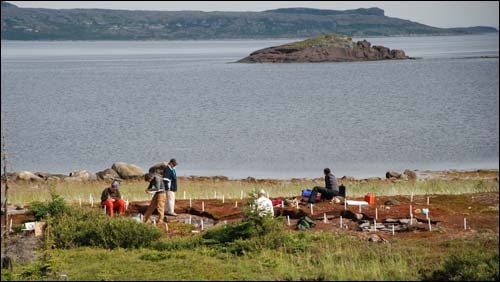 Findings from the new archaeological, archival and historical research will provide a significant stimulus to the nascent heritage tourism industry in southern Labrador. In addition, the employment of numerous Métis on the project will result in a body of trained experts who will be more than capable of developing this business. In addition to this web site, Labrador Métis and other members of the public will have full access to the ongoing research findings through touring exhibitions, public forums and other media.